This page shows the latest corporate social responsibility news and features for those working in and with pharma, biotech and healthcare. the content management/curation and corporate social responsibility categories. ... Digital inspiration for pharma on mobile, social media, strategy, best practice, regulations and more. As part of bringing these activities together in a more integrated way, the Communications and Corporate Social Responsibility teams will report to Kumar. Synergy Vision awarded Gold at International Business Awards. corporate social responsibility and sustainability, including environment, diversity, equality, community, charity initiatives, education, ethical, health and welfare issues. The MDT Roadshow. Excellence in Corporate Social Responsibility or Not for Profit/Pro. 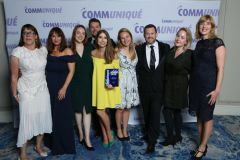 Following a win at Comm uniqué 2015 in the Excellence in Corporate Social Responsibility or Not for Profit/Pro Bono Programmes category, the ASTELLAS INNOVATION CHALLENGE, developed by emotive, has been ... CSR (corporate social responsibility) award.